NetPlanner employees will participate in Walk to End Alzheimer's to raise awareness and funds for research. 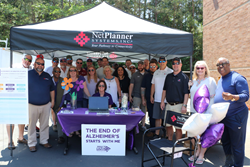 NetPlanner Systems is pleased to support the Alzheimer’s Association Walk to End Alzheimer’s in Greater Atlanta. Walk to End Alzheimer’s is the world’s largest event to raise awareness and funds for Alzheimer’s care, support and research. NetPlanner employees will participate in Walk to End Alzheimer’s at the Kennesaw State University Sports and Entertainment Park at 9:30 a.m. on October 13, 2018. The mission of the Alzheimer’s Association is to eliminate Alzheimer’s disease through the advancement of research; to provide and enhance care and support for all affected; and to reduce the risk of dementia through the promotion of brain health. Please click here to donate or join the NetPlanner team.